Rubber crusher is to be used for raw rubber cracking and scrip rubber cracking in rubber reclaim industry. 2. Being made of cold hard alloy cast iron, the roll wears well. The rolls have 3 types: double-channeled roll, single-channeled roll and double-smooth roll. 4. Convenient range adjustment is set in manually operation. The whole machine adopts bottom head for convenient carrying and maintenance. For reclaim rubber industry , normally we suggest rubber cracker/crusher XKP-450 or XKP-560 for making reclaimed rubber powder from waste tire or tube or other waste rubber products. 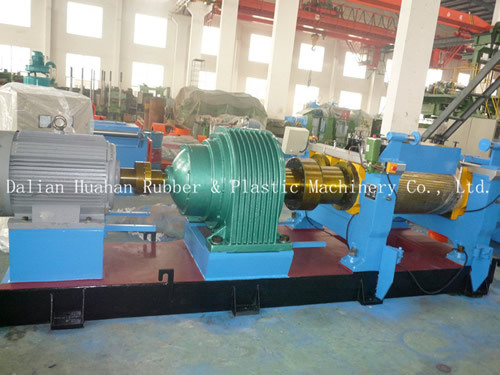 China Huahan Rubber & Plastics Machinery CO.,LTD. established in 1986, is the largest rubber machinery manufacturer in china, main products has: China internal mixer, China Open mill, China Dispersion kneader, Banbury mixer, Mixing mill, Rubber calender, Rubber crusher, Rotary curing machine etc.